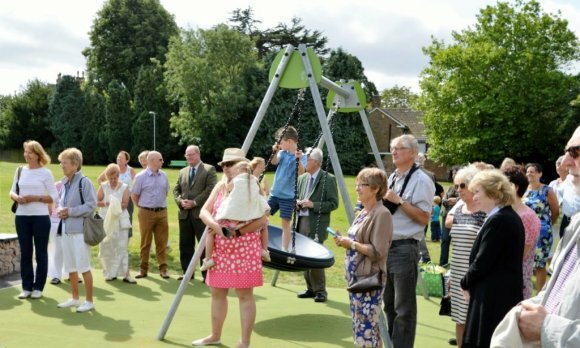 The official opening ceremony for the long awaited Activity Park on the Rectory Field, Nottingham Road took place on Saturday, 13th August. Click here for photographs. Construction of the Activity Park has been made possible by grants from Sport England, WREN and Rushcliffe Community Partnership, but the campaign for such a facility, the need for which was highlighted in the 2009 Village Plan, started with a fund raising initiative which set a new world record for the highest number of postcards posted in a single location in one day. This initiative was the brainchild of local resident Brian Lund who was helped by the staff of the local Post Office, run in those days by Margaret and the late Roy Eggleston. Brian & Margaret have been invited to declare the Activity Park officially open on 13th August, and the Parish Council chairman, Cllr Tony Grice says: "It's fitting that Brian and Margaret should do the honours, because it was the postcard initiative which kick-started the campaign and drew lots of people's attention to it". Cllr Grice also says: "We are very grateful to Sport England, WREN and Rushcliffe Community Partnership for providing the funding which has made the Activity Park a reality. There was a real need for a facility like this close to the centre of the village, bearing in mind that the Play Area on Nottingham Road is only for children up to age thirteen. A lot of people have worked long and hard to bring this project to fruition and Keyworth Parish Council would like to thank each and every one for their contribution; unfortunately. there are too many to be named individually". Charles Johnston, Sport England's Property Director, says:"Investing in facilities like this activity park is at the heart of what we do at Sport England.We're very excited and look forward to seeing it being used regularly by local residents and encourage more people to take part in outdoors activities this summer". WREN is a not-for-profit business that awards grants for community, conservation and heritage projects from funds donated by waste and resource management company FCC Environment through the Landfill Communities Fund. Cheryl Raynor, WREN's Grant Manager for Nottinghamshire says "It's always nice to see something we have funded nearing completion. We're delighted to be supporting such a worthwhile project and look forward to it benefiting people across the Keyworth area". Cllr John Cottee, Rushcliffe Borough Council Portfolio holder for Communities says: "Rushcliffe Borough Council are delighted to support the great fund raising efforts of the local community by unlocking long-held 'Rushcliffe Community Partnership funding'. It's perfect timing as the park is opening right before the school summer holidays and this fabulous facility will inspire the young people of Keyworth to get outside, be active and have fun".